In the candlelit space of the Café Carlyle, there is silence. The only sounds are the clinking of cutlery, hushed laughter, and the artificial “ snap” of an iPhone camera pointed at the empty stage. Everyone waits, politely, for the evening entertainment. But, even with nobody standing on that stage, it’s still got star power. Bobby Short, the 20th century's most popular cover artist, held tenure here for 35 years, so did popular session pianist George Freyer. And, nowadays, you can often spot Paul McCartney along with musical rival Mick Jagger, nodding- approvingly, we assume- at the artists performing there. Somebody breaks the silence. “It’s Woody Allen!” they say and just like that the evening’s entertainment begins. Woody Allen and his Jazz Band…nothing less than that. 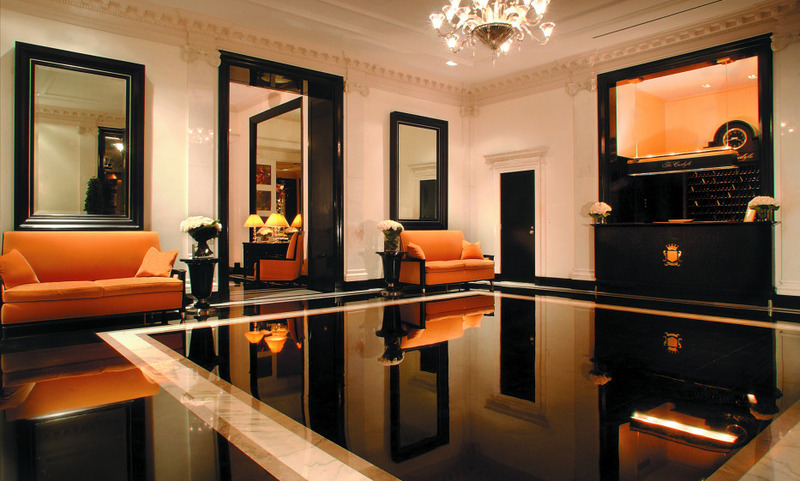 The Carlyle, A Rosewood Hotel is one of the most luxurious hotels in New York. But that’s not why some of the biggest A-Listers on the planet check-in time and time again. Here it’s all about being among friends, and living a lifestyle that you can’t get anywhere else but behind these gilded doors. And what a lifestyle it is. Enjoy sweeping views of Central Park from within its elegant Art Deco rooms, sip champagne under a 24-karat gold leaf ceiling at the Bemelmans Bar, and get pampered in its Yves Durif Salon before heading out on Fifth Avenue… now that’s the high life. Kindly note that the hotel will undergo refurbishment work, taking place Monday through Friday from 9:00am to 5:00pm until the end of the year. The noisier work is limited to the hours of 10:00am to 4:00pm on certain days. The Carlyle has a great location on Manhattan's upper east side amidst designer boutiques, Central Park, galleries and world-renowned museums. Guests enjoy live jazz in Bemelmans Bar and classic cabaret in Café Carlyle, with incredible talents like Woody Allen. Guests revive their spirits at the hotel's luxurious Sense spa, featuring Sisley Paris. We love the hotel and its location. The front desk staff was extremely pleasant. The breakfast staff are very friendly and efficient. Probably the best City hotel we’ve stayed at. Alal Gogo was particularly outstanding. He managed to arrange for us to attend the Woody Allen Band show with our guest (who is a musician) even when it had been booked out and was very courteous throughout. Thank you so much. A wonderful stay. Fantastic hotel, great atmosphere, room upgrade was much appreciated. All the staff I interacted with were great. One of the best hotel experiences I have ever had. I would unreservedly recommend the hotel and will return. This was our third stay at The Carlyle and we were made extremely welcome. The staff are first class and nothing is too much trouble. We were sorry to leave but will return. Very nice hotel extremely well located on the Upper East Side, 2 steps from Central Park and museums. The hotel is very charming, well attended with an elevator operator in white gloves in each lift. There’s a vintage charm that is very nice. Great concept of the spirit of service. Breakfast staff is perfect and everything is done to satisfy the customer. I would recommend it for a short or long stay in NYC. I adore the Carlyle and would recommend it to anyone who plans to stay in New York City whether on business or pleasure. The views of Central Park and south towards mid-town Manhattan were spectacular from our corner room on the 33rd floor. It was perfection! I would certainly stay at the Carlyle again, next time that I'm visiting New York and I'd certainly recommend it to friends and business associates as a great place to stay. Everyone I dealt with at the hotel, from the doorman, to the elevator operators, to the housekeeping maids, and so on were all very friendly and helpful and made my stay most enjoyable. We were very impressed by the hotel. All staff were very friendly and efficient and the hotel beautifully decorated. We would very much like to return one day! I knew that The Carlyle was not renowned for its interior design, but I was still disappointed by the room decor I found very cold. Heartbreaking detail for a 5-star hotel : the door of the bathroom creaked ... The staff is excellent - special mention to Jeff and Waldo at the Concierge desk for their amazing efficiency sens of humour. A great atmosphere in the bar with the concerts. The hotel was great. The quality of the food and service was excellent. The staff were excellent too. Especially the Concierge (Waldo and Jeff were brilliant, very knowledgable, approachable and and very helpful).